Does anyone prefer Gibson VOS finish to gloss? Discussion in 'Guitars in General' started by guitaraddict, Aug 14, 2008. Does anyone prefer Gibson VOS finish to gloss? Just curious? Seems like everything is VOS, maybe just a way to make a extra $300 from people who don't like it? No, I prefer the gloss finish, unless we're talking about the Tom Murphy Aged.. I don't really mind it on most of the guitars. Black or guitars with gold hardware are the only that I would really prefer to have non-VOS. 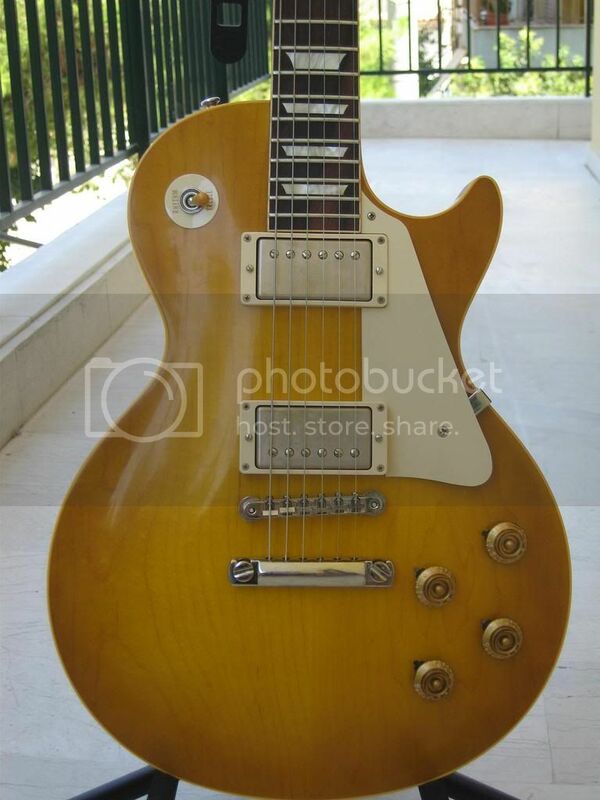 I really like VOS Gold Top's, I think the duller finish really looks cool with the gold flake. I don't mind it on most Burst's and TV Junior's, SG's look fine but I'm not completely crazy about the faded cherry on mahogany guitars as it looks orange. I really like it on my R8. Prefer it? Yeah, maybe so... I think it's great. I love them all, just wanted to see what others thought. I prefer gloss, but I would do either if the guitar was great sounding. I prefer the VOS finish on my R8. I love the worn in feel. It's interesting that the Gibson Custom Shop charges less for the aged/relic treatment while Fender Custom Shop charges more. i prefer a shined up VOS to gloss. but it just looks gunky on my R4 Oxblood LP. Just doesn't seem to work as well with dark solid colors. it frustrates the hell out of me that vos is the standard now. Seems kinda crazy that you have to pay more for a gloss finish. Agree. I had been considering an R9 but some here have steered me towards an R8 and I think that is now what I will go for I (I actually prefer the plain top) - but I want a gloss finish and just can't find one (in the UK) at the moment. If it turns out I have to order then you have the dilema of not being able to try before you buy. Does anyone happen to know whether the gloss version still has aged hardware, or is that nice and shiny too? I really like the VOS finish on my R8 Lemonburst. Then again, I prefer plain to figured tops, too. I also have a black Deluxe and I hope that in years its finish will become duller. gloss or high shine looks gaudy to me. The opposite of what I think of rock or blues. I prefer the VOS finish. I have a standard faded that I bought from CV Guitars which has been polished and I really dig the look. I think gloss looks better on a blue matteo PRS or something like that. The gloss models have unaged hardware, atleast the ones I have seen.